Birmingham - Acocks Green, Ashted, Aston, Balsall Heath, Bartley Green, Birchfield, Boldmere, Bordesley Green, Browns Green, Buckland End, California, Castle Vale, Cotteridge, Deritend, Digbeth, Duddeston, Edgbaston, Erdington, Four Oaks, Garretts Green, Gravelly Hill, Great Barr, Hall Green, Hay Mills, Highgate, Hockley, Hodge Hill, Jewellery Quarter, Kents Moat, Kingstanding, Kitts Green, Minworth, Mere Green, Moseley, Nechells,Shard End, Sheldon, Short Heath, Small Heath, South Yardley, Sparkbrook, Sparkhill, Stechford, Stockland Green, Sutton Coldfield, Tyburn, Tyseley, Wake Green, Walmley, Ward End, Washwood Heath, Whitehouse Common, Witton, Winson Green, Woodgate, Wylde Green, Yardley, Yardley Wood. Solihull - Balsall, Balsall Common, Barston, Bentley Heath, Berkswell, Bickenhill, Blossomfield, Castle Bromwich, Catherine-de-Barnes, Chadwick End, Chelmsley Wood, Cheswick Green, Coleshill Heath, Dickens Heath, Dorridge, Elmdon, Elmdon Heath, Fordbridge, Hampton-in-Arden, Hockley Heath, Kingshurst, Knowle, Lyndon, Marston Green, Meriden, Monkspath Street, Olton, Packwood, Sharmans Cross, Shirley, Smith’s Wood, Solihull, Temple Balsall, Tidbury Green, Whitlock’s End. 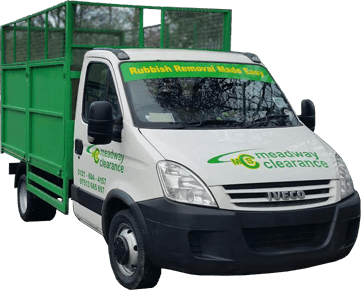 Meadway Clearance Services Provide Both Commercial And Domestic Rubbish Removal And House Clearance Service covering Birmingham/ Solihull . 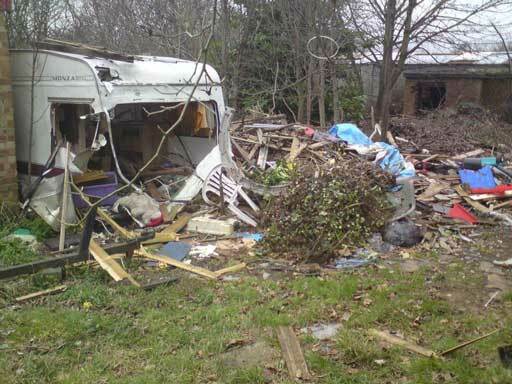 Whether you just have a small amount to get rid of or a full building of unwanted junk then we can clear it for you. All our staff are Fully Uniformed and CRB Checked! Arrived on time as planned. Did a good job in our time of need. Communicated well. Would use again. All our clearance services comply to ‘Environmental Policies’ and regulations set out by the government. We are a fully licensed waste disposal carrier and have 25 years experience in the waste and recycling industry. Most of the waste we collect goes to recycling depots and licensed waste transfer stations and if items can be reused they go to local charities or sold on. 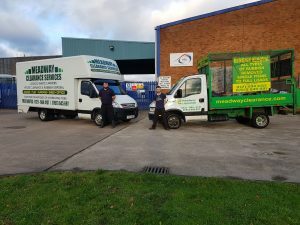 In addition to waste disposal we also provide all manner of clearance services whether domestic or commercial including house clearance or general house waste and rubbish to white goods removal and disposal. As well as house clearance we cover Shed/garage clearance and garden clearance. Office clearance and shop clearance are amongst the many types of commercial clearance we are also able to offer. 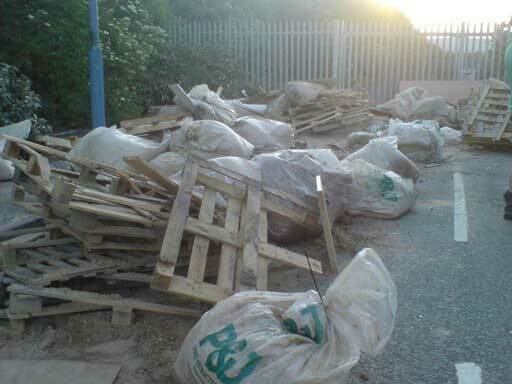 Our current prices for waste clearance can be found on our prices page. 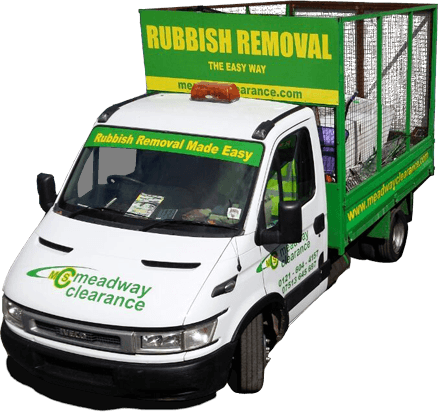 Using Meadway Clearance Services instead of a skip takes the stress out of clearing your junk and is often cheaper . 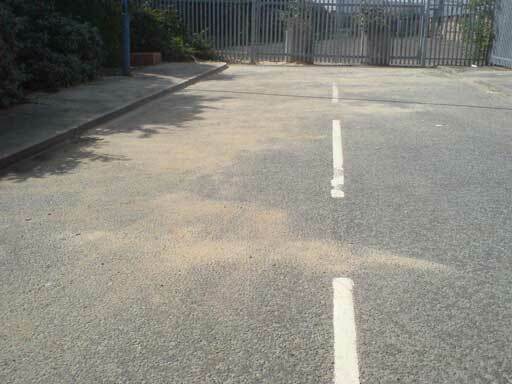 Our staff do all the hard work leaving your premises clear and tidy. We are reliable, friendly, and affordable. 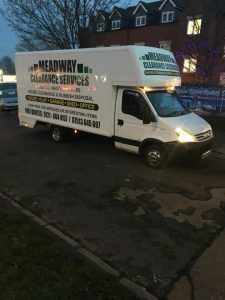 Meadway Clearance Services always operate with Safety and Common Sense in mind, however as is life accidents can happen, therefore we hold £5,000,000 Liability Insurance. We remove any unwanted items such as beds,sofas,,old furniture, clothes, household bric-a-brac, electrical appliances, books, old kitchen units, white goods, garden waste, and much more. We can clear your Home, Office, Factory, Shop, Garden, Garage, Storage unit in fact just about anywhere. For a full list of items we can and can not remove please see our clearance list. Take the stress out of a house clearance, whether it be clearing the home of a deceased relative or preparing a house for sale, we can provide a professional and prompt house clearance service. AND WHERE POSSIBLE OFFSET ITEMS OF VALUE AGAINST THE COST OF THE JOB. Where possible, we reuse some items by donating them to local charities, and also to some animal centres (RSPCA, pet clinics etc). We can clear any office items from single items to complete clearances, this includes office furniture, cabinets, computers, trade waste and much more. A selection of some of our previous clients can be found on our clients list. We can remove garden waste from foliage and green wastes to garden sheds, pots, tubs, BBQ’s plus much more. 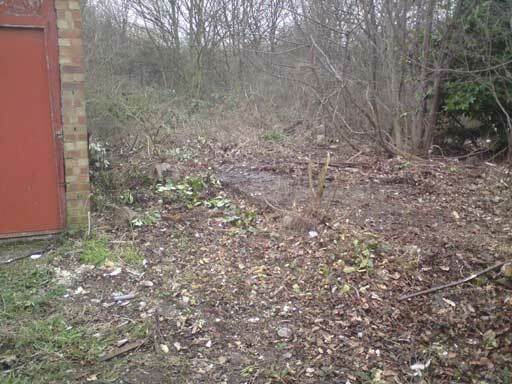 Various types of clearance ‘Before’ and ‘After’ pictures can be found in our gallery. Why pay to have a skip for your neighbours plus any passers by to use?! 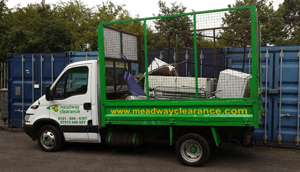 By using Meadway Clearance Services we do the hard work by loading and removing. In addition if you have less than skip load to move then you only pay for what you need to clear instead of a whole skip. In some cases you may even need a permit for a skip, yet another good reason to use Meadway Clearance Services instead. Then check out our FAQ page for some answers to common questions, however you can always use our contact page to submit your query. 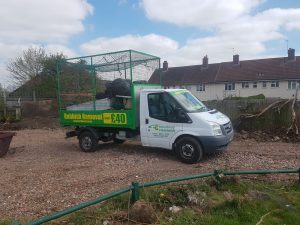 If you do not have room for a skip and have to put it on a verge, pavement or on the side of a road you will require a skip permit at a cost of £35 – £67.00 – based on prices charged by 13 skip hire companies in Birmingham. Only one skip is allowed at any given time in a permitted site. Our vans load twice the amount of a large 8 yard skip. There are no hidden charges or booking fees or VAT to be added. We do all the loading – All labour and disposal fees are included. Confused about how much it will cost? No problem! Simply send us a photograph of what you need clearing or drop us an email to arrange a free no hassle quote for your rubbish removal, house clearance or office clearance. For a full list of items we do and do not remove please see our clearance list.